Did you know that by chewing your food more, you can improve your digestion? Something as simple as chewing more, can increase circulation, enhance immunity, increase energy & endurance, as well as improve skin health & stabilize weight! Digestion actually begins in our mouths, when our food makes its first contact with our teeth and the digestion enzymes in our saliva help break down the food we are eating. We are usually so rushed during our day to day activities that we tend to forget to chew our food well. We are eating while we are distracted, whether we are working, reading, talking, or watching TV. On average, we only chew each bite of food 8 times before swallowing. 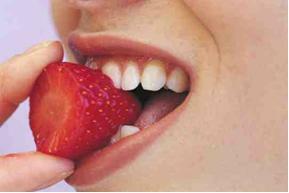 Saliva will help break down our food into simple sugars, which makes our food sweeter. The more we chew, the sweeter our food becomes and it will help cut down on those sweet cravings we get after our meals. Chewing reduces digestive distress and improves assimilation, allowing our bodies to absorb maximum nutrition from each bite. The more we chew, the more endorphins we produce, which helps create more good feelings! The slower you eat, the more in tune you are with your body. When we chew slowly, we are more likely to notice when we are full. Slowing down allows you to enjoy the smells, flavors, and textures of your food. Try eating without any technology readily available or on. Turn off the TV, cell phones, and close your book or newspaper. Pay attention to what you’re eating and enjoy the company of the people around you. Try counting how many times you chew a single bit. Try increasing this to 30 chews per bite. It will be hard at first, but with the benefits listed above, it’s well worth it.